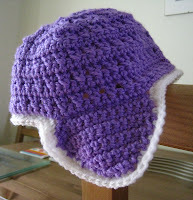 My mum sent me a pattern from her copy of Woman's Weekly so I could join in with the latest Save the Children campaign which is trying to get knitters and crocheters all making up hats for newborns. I've had a number of problems in working up this pattern though - to the point where I almost tore it apart in frustration. The pattern is worked from the bottom up as one flat piece and then joined together at the end. The instructions for this are very confusing and the pattern's main stitch is working crossed dc's which I had not encountered before. I'm very tempted to have a go at writing a similar pattern that would be quicker to work up and much easier to understand... for starters I would certainly want to be working this in a round with no joining together at the end. I may even publish it on Crochet Me so that anyone else who wants to join in this appeal can have a nice simple pattern to work with. 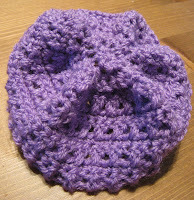 For a quick laugh I've included a photo of my first attempt making this pattern up - looks pretty bad right?